The Iraq war is costing about a trillion dollars and it could easily drag on as Viet Nam did for another decade. This has lead to massive deficits. The 2005 deficit was $400 billion. In addition because of outsourcing, the USA, a former net exporter, had a $800 billion trade deficit in 2005. It imported $800 billion more than it exported. In 2006 this is projected to grow to $1 trillion. This shortfall is one of the factors causing the buying power of the US dollar to collapse. 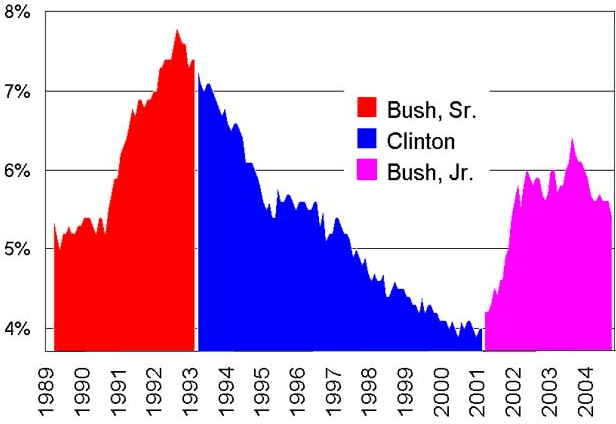 To keep up with population growth, in his first term, Bush needed to create jobs for 12 million new people. He had a net job loss the first time since the great depression and Herbert Hoover. 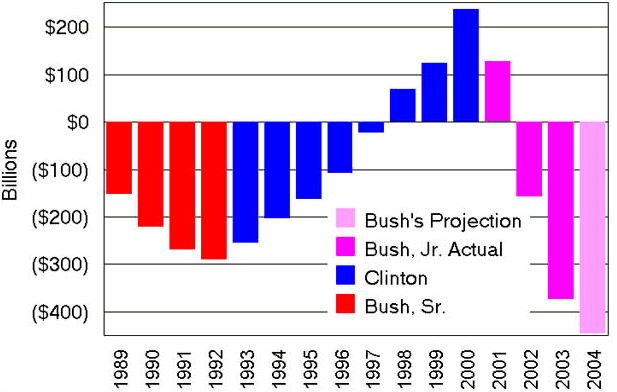 Bush has the biggest deficits of any president in history and is the first president in over a century to actually destroy more jobs than he created. I contend the USA is ridiculously overspending on the military, all out of proportion to the threat. For example, even back in 2003 before the USA doubled its military spending, it was still spending more than all the other countries of the earth combined. There is no way that sort of expenditure is justified purely for defense. Note that the bogeymen the USA claims to fear, Iraq and Iran are not even on the map. Military spending has already bankrupted the country in the sense that even future generations will not be able to make good on the outstanding debt according to Professor Laurence Kotlikoff of Boston University speaking for the Federal Reserve Bank of St Louis, a leading constituent of the US Federal Reserve. You see a slightly different picture when you took at per capita spending. The USA in then not quite so overwhelming. The pugnacious Israel shows her true colours. 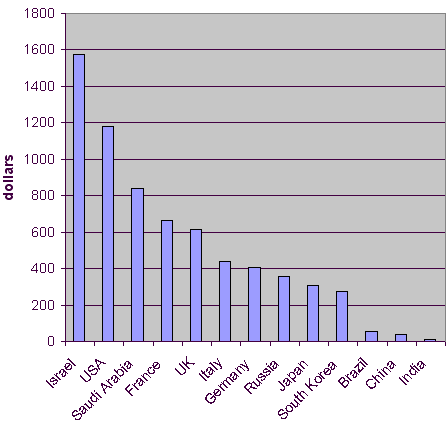 Of course, that level of military spending would be impossible if the USA did not give 1/3 of its total foreign aid budget to Isreal for military spending. Keep in mind that since these stats were taken, the USA has greatly increased its per capita spending to cover the costs of the war in Afghanistan, the Iraq war and the costs of the homeland security bureaucracy. Here are the 2003 figures. The USA has military bases in almost every country on earth. There are obviously not for defending the homeland, but for defending America’s economic interests abroad. Consume 45% of all meat and fish, the poorest fifth 5%. Consume 58% of total energy, the poorest fifth less than 4%. Have 74% of all telephone lines, the poorest fifth 1.5%. Consume 84% of all paper, the poorest fifth 1.1%. Own 87% of the world’s vehicle fleet, the poorest fifth less than 1% . Runaway growth in consumption in the past 50 years is putting strains on the environment never before seen. Most Americans are astonished when academics such as Chalmers Johnson or Noam Chomsky explain to them they have a global empire in everything but name. The point of this empire is to support a lavish consuming lifestyle at the expense of the third world. The American military’s job is to pressure foreign governments to give American businesses what they want. How else could it be that Americans manage, with under 6% of the world population, to consume about a 40-60% of the planet’s resources? How is it possible that people in other parts of the world accept a $0.06 a hour wage to produce goods for Americans. That is less than slave wages. Slaves, like livestock, at least had their food and medical bills covered and even a form of retirement. Calculations show that the planet has available 1.90 hectares (4.70 acres) of biologically productive land per person to supply resources and absorb wastes — yet the average person on Earth already uses 2.30 hectares (5.68 acres) worth. These ecological footprints range from the 9.70 hectares (23.97 acres) claimed by the average American to the 0.47 hectare (1.16 acres) used by the average Mozambican. Like a French aristocrat of old, the modern American believes he fully deserves his privileged position as a right of birth. He deserves it for being American, one of God’s chosen people. He vaguely imagines that his industriousness or other innate virtue fully explains the economic disparity. He labours under the delusion that those in the rest of the world are happy to work in American sweat shops. It never enters his head that such extreme inequality can only be maintained by global military oppression and state-sponsored political corruption to bribe and threaten world leaders to act in the interests of American business rather than the interests of their own countries. The main difference in the outcome of WWII (World War II) was the language we speak. The economic neocolonialism is the same as had the Nazis won. Just as Nazis saw themselves as innately superior and deserving of special privilege, so do Americans. They don’t recognise that their superiority complex is just as odious to others and leads them to just as evil deeds. The price of empire is America’s soul and that price is too high. 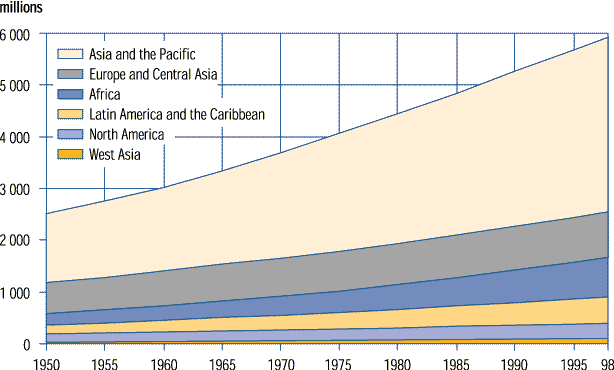 You can see from this graph of world population growth the incredible extra burden we are putting on the earth’s carrying capacity, especially in Asia and the Pacific. There are ever more people fighting for a dwindling supply of resources. Bush presided over a $3 trillion dollar embezzlement and covered it up. The war is a cover for massive embezzlement. Bush lost/embezzled $3 trillion from the Pentagon. Not $3 billion, $3 trillion, that is $3,000 billion, 10 Iraq wars worth or $40,000 per US family. The complicit Bush-friendly media kept mum about the biggest theft in history, though months later the San Francisco Chronicle finally covered some of it. Most people are astounded to learn that Rumsfeld confessed to the loss on camera and excused it as an accounting error. Unfortunately all trace of this video has disappeared from the Internet. I spent hours trying to find a copy. It was available for many months on C-SPAN originally. You really need to see the original video to understand how Rumsfeld squirmed. Part of the problem in tracking this down is that McKinney has repeatedly tackled Rumsfeld on this issue. According to the Comptroller General of the United States, there are serious financial management problems at the Pentagon, to which Mr. Cooper alluded. Fiscal Year 1999: $2.3 trillion missing. Fiscal Year 2000, $1.1 trillion missing. Note that neither Mr. Jonas nor Mr. Rumsfeld dispute this in the transcript. McKinney did a day long probe into 2001-09-11 and related issued on 2005-07-22, broadcast on 2005-09-11. Perhaps that will reawaken in interest in the missing trillions. 8.8 billion dollars earmarked for the Iraq war have also been embezzled, or in Bush speak is improperly accounted for. And, of course, Iraq’s own oil money went missing as well. The war has caused record deficits. Bush has improperly raided the social security fund to partly cover up his spending bloat. Table data from Crossing The Rubicon page 499. The embezzlement/missing figures for subsequent years have not yet been released yet. 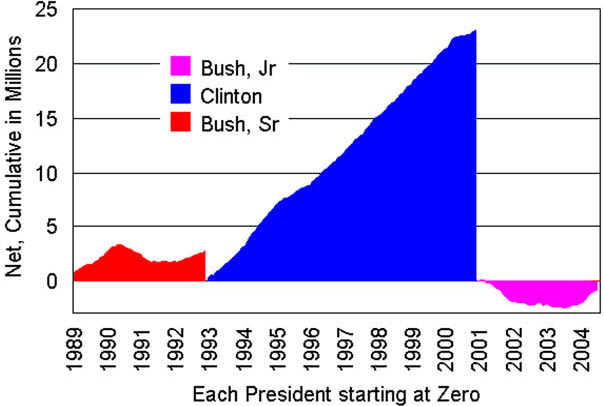 Perhaps even more startling than the missing trillions is that Bush appears to have bankrupted the country on purpose. To discover why read his brother Jeb’s essay. We must create a [economic] crisis in order to ensure that there is no alternative to a smaller government. This may explain why brother George seemed to be intentionally attempting to tank the economy. To bring about a genuine political realignment, Republicans must kill the Government Goose that Lays the Golden Eggs — the very Goose they have fought so hard and long to possess. In other words, Jeb wants to stop the functions of government that create prosperity. The man is either nuts, or has the same problems with English as his brother. We mustn’t assume that we are going to deinvent government solely from inside the Beltway or within one or two sessions of Congress. We will do it one step at a time, in one community at a time – at the local level and through local institutions like churches, nonprofit and volunteer organizations and families. Jeb wants to destroy democratic government and hand the reigns to private corporations, much the way society was organised in the 1800s, without any regulation on the robber barons. He must have been impressed by the 1975 sci if movie, Rollerball, starring James Caan. If they had their way, you would have to use Fedex for all your mail, since there would be no US postal service. You would have to send your children to private schools since there will be no more public schools. You will have to hire your own security guards, since there will be no more police. There will be no more Medicare, Medicaid, welfare or social security pensions. There will be no federal drug, meat, food or aviation safety inspection. There will be no regulations on commerce, drugs or prostitution. There will be no licensing of dentists, doctors or surgeons. It sounds a bit like the world of Mad Max and the Thunderdome. Delay imagines he will be an Auntie Entity. Why does this appeal to him? The rich will pay even less taxes than now. They don’t care that life would be gritty or that it would cost them more than now, they resent supporting others so strongly with their taxes. That is what matters most to them, avoiding helping others. As usual this book has the right spitting angry, spouting ad hominems, but not a word to counter a thing Chomsky says. It covers American imperialism from Kosovo to Iraq.